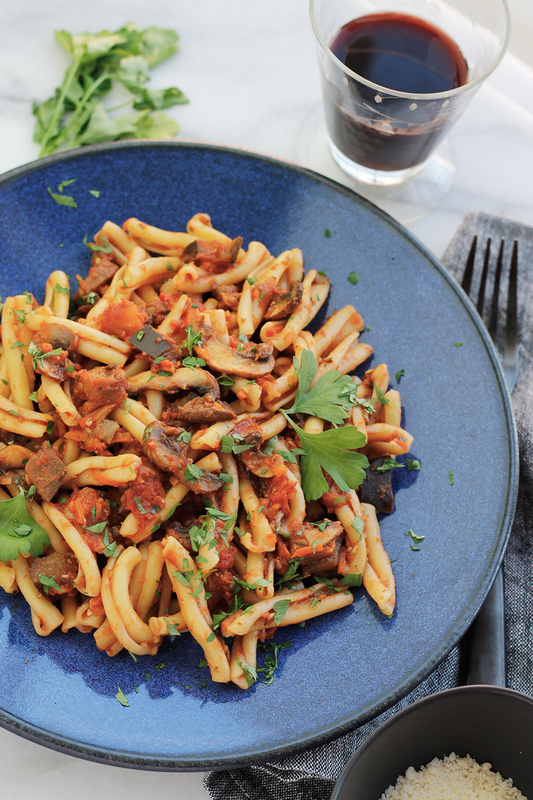 Vegan Eggplant Mushroom Bolognese with Casarecce, a healthy, hearty and bold with flavor pasta dish. Perfect for a busy weeknight dinner. Bolognese sauce over spaghetti was once one of my favorite meals and it was always better the second day. When I stopped eating meat I had to find other ways to bulk up my pasta sauce. Adding chunky veggies is a great way to add bulk, however, I’m not a big fan of chunky veggies in my sauce. I prefer to add hearty veggies in smaller pieces, and as the sauce simmers everything marries together into a bold and delicious sauce that pairs well with most medium to large pasta. 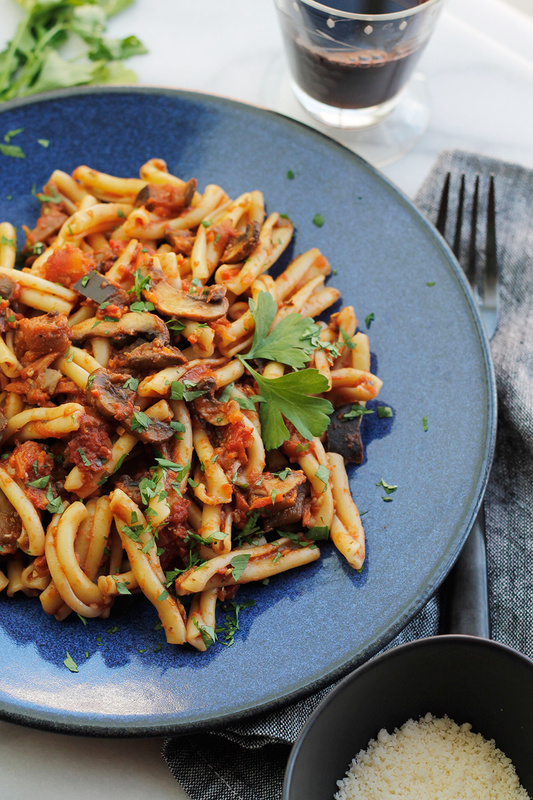 The combo of eggplant, mushrooms, and carrots add bulk and nutritious goodness to this vegan bolognese. I don’t use eggplant as often as I should, but I’m starting to include it where and when I can, it’s loaded with benefits. 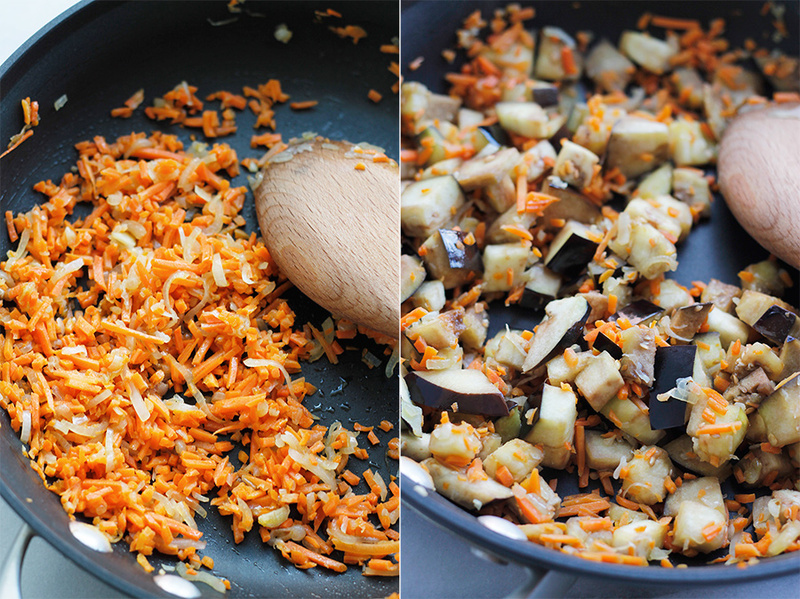 Quick Tip: For the carrots, I started with shredded carrots to make the chopping easier. Mushrooms are a natural for adding bulk, along with the added carrots, eggplant, and simmering this sauce thickens to perfection. Bolognese is the most commonly paired with spaghetti noodles, and it’s great, but sometimes I like using casarecce pasta noodles. 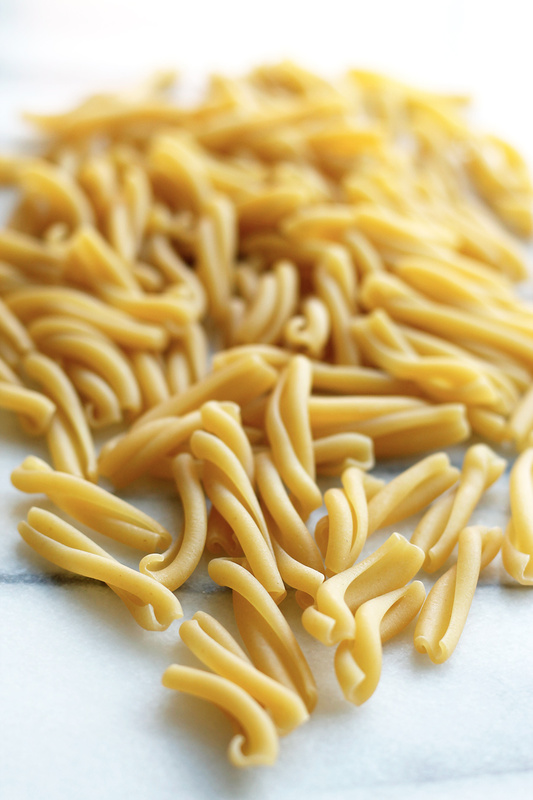 Casarecce pasta is shaped into a narrow, twisted and rolled tube. This means there is more surface area for the sauce to adhere to and it holds up very well with chunky, hearty sauces. In a pot of salted boiling water cook casarecce until al dente. Drain, reserving 1 cup of the pasta water. Place pasta back into the pot, toss with a drizzle of oil, cover and set aside. In a large nonstick skillet heat 1 tablespoon of the oil, add the shallots and carrots and sauté over medium heat until it starts to soften, about 5 minutes. Add eggplant to skillet and continue to sauté until eggplant starts to soften. Stir in the sliced mushrooms and remaining oil if needed. And season with salt and pepper, continue to cook stirring occasionally for another 6 to 7 minutes, mushrooms should be softened. Add garlic, tomatoes, tomato paste, paprika, herb de Provence, and sugar, stir to combine. Reduce heat to medium-low, cover and simmer, stirring occasionally, until sauce thickens, about 30 minutes. If the sauce is too dry add some of the reserved pasta water. Add cooked pasta,1 tablespoon of the parsley and red pepper flakes to the sauce, stir to combine. Taste add salt and pepper if needed. Plate sprinkle with more parsley and serve. Store any leftovers in an airtight container in your fridge. 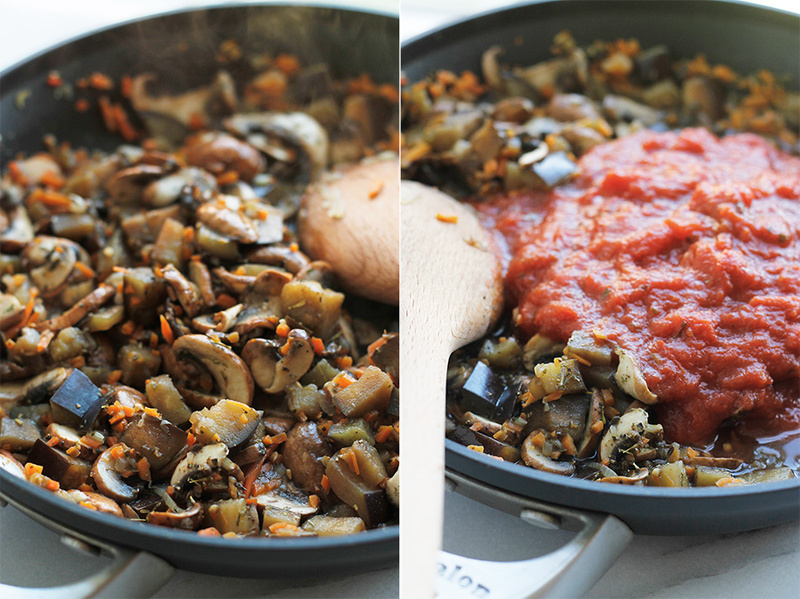 If you like this you may like this Fire Roasted 20-Minute Pasta Sauce. I actually frequently prefer shaped pasta over spaghetti, I love the way sauce adheres and it’s far less messy to eat. I’ve never seen Casarecce pasta but would like to try it. Isn’t this interesting. I just picked up some eggplant while grocery shopping and was wondering what I was going to do with. This is perfect. Eggplant is in abundance here right now. I have a ton ripe in the yard and needed new ideas this is perfect! I love eggplant but usually, never use it in my pasta. I must try this. We had spaghetti often so this is definitely one I can try soon. Sounds so yum. Saving for later. 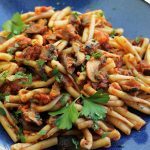 We love recipes with eggplant and mushrooms in my house and eat vegan or vegetarian most of the week so this recipe is perfect for me. Thanks for sharing! I’ve something similar with zucchini. 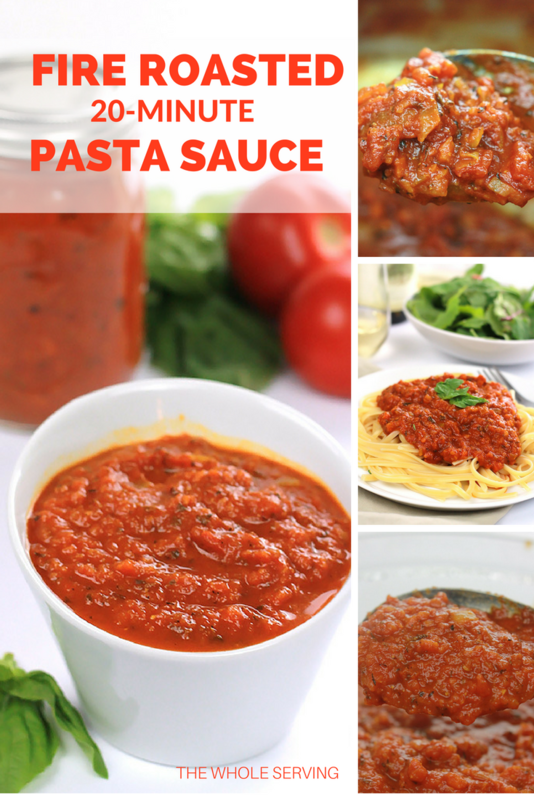 I’ve shredded it and added to the sauce, It does make a nice thick, hearty sauce on the pasta. I like the way you cut the eggplant into some small chunks. That gives you something to sink your teeth into. A chunky ragu is always welcome at our house. We love the addition of vegetables to our pasta sauce and instead of having them melt away we enjoy the texture in the sauce. 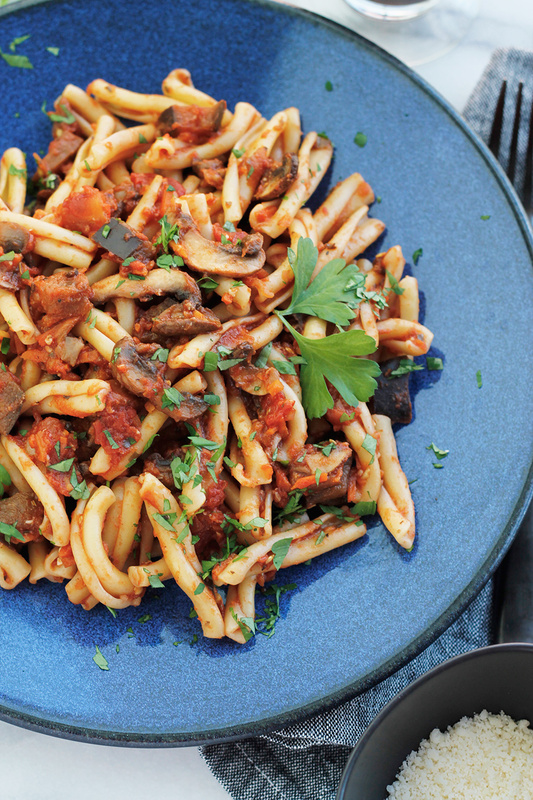 We love the taste of eggplant – we’ll have to add some to our ragu next time we make it. This looks delicious! 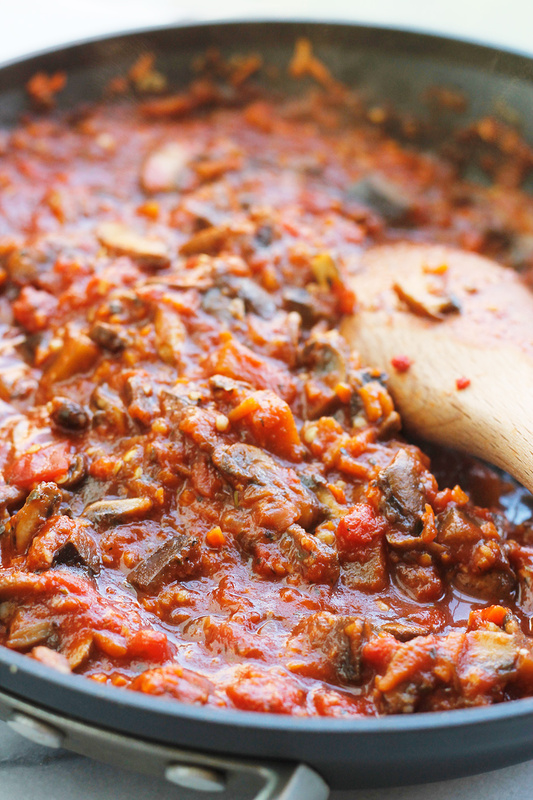 Usually I add just mushrooms in my bolognese so I can’t wait to give it a try with eggplant as well. Yum!! I’m SOOOO loving this recipe! Looks and sounds absolutely fantastic. We all love a good bolognese during the week so I’ll be making this for sure. I never tried mushroom + eggplant bolognese before. Can’t wait to try this out. Oh goodness, this looks absolutely amazing. 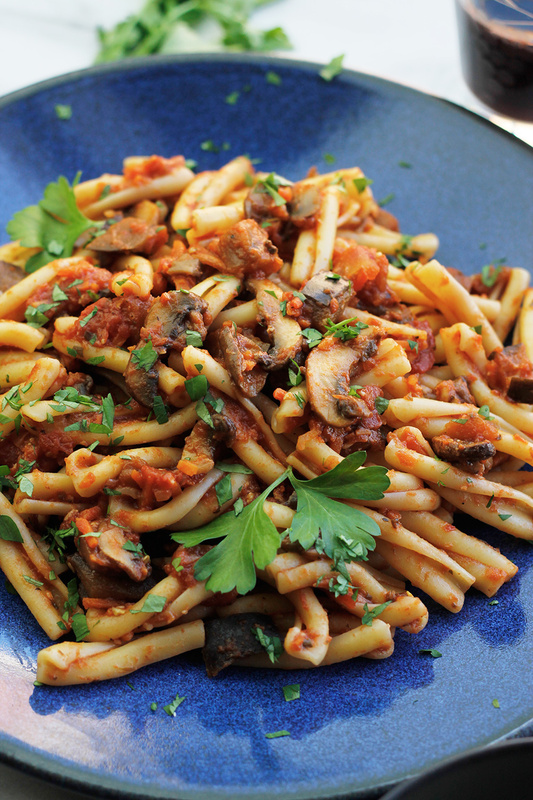 I love vegan pasta dishes and eggplant is one of my favorites. Thank you. Looks delicious I love eggplant and makes curries with it. This is a whole meal you made with eggplant and mushroom that sauce sounds really flavorful. Can you believe I have never bought eggplant before?? This looks so good, I am considering buying some when I get back from my vacation! Vacation, sounds like fun, my vacation was in June, seems like ages ago. Cathleen you have got to make this, it’s so delicious and it makes great leftovers.